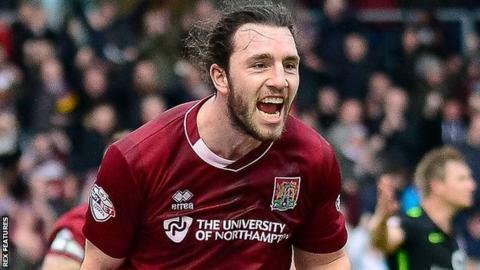 Northampton Town extended their lead at the top of League Two to five points with victory over 10-man York City. York's Russell Penn had an effort cleared off the line by Lee Martin, before Martin's corner set up John-Joe O'Toole to head the hosts in front. Marc Richards doubled the lead after the break when he collected Ricky Holmes' pass to fire into the net. The Minstermen were then reduced to 10 men when Luke Hendrie was shown a straight red card for a foul on Holmes. The result meant the Minstermen remain bottom of League Two, four points adrift of safety. "The conditions were unbelievable but we tried to get the ball down and play. "As always the result was most important and we looked dangerous in real tough conditions. "We are after points and we just have to keep rolling the wins out if we want to achieve." "I was disappointed with the goals we lost, one from their corner and one from a breakaway from our corner. "Before both goals we had chances ourselves that were cleared off the line. "It was never a red card. I've seen it back. I think the referee's decision was influenced by certain things going on." Match ends, Northampton Town 2, York City 0. Second Half ends, Northampton Town 2, York City 0. Attempt missed. Michael Coulson (York City) right footed shot from outside the box is just a bit too high from a direct free kick. Attempt blocked. James Berrett (York City) right footed shot from outside the box is blocked. Attempt missed. James Berrett (York City) right footed shot from outside the box is close, but misses to the left. Attempt blocked. Ricky Holmes (Northampton Town) right footed shot from the right side of the box is blocked. Attempt missed. Rod McDonald (Northampton Town) header from the centre of the box misses to the left following a corner. Corner, Northampton Town. Conceded by Dave Winfield. Russell Penn (York City) is shown the yellow card for a bad foul. Substitution, Northampton Town. Nicky Adams replaces Marc Richards. Attempt missed. Ricky Holmes (Northampton Town) right footed shot from outside the box is close, but misses to the left. Lubomir Satka (York City) is shown the yellow card for a bad foul. Foul by Lee Martin (Northampton Town). Attempt missed. Lee Martin (Northampton Town) right footed shot from outside the box is too high. Corner, York City. Conceded by Ryan Cresswell.